Actress Park Shin Hye found her Doppelganger which turned out to be herself. 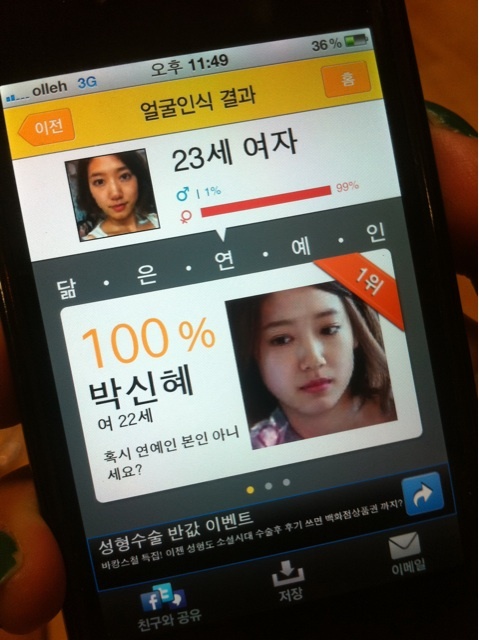 Park Shin Hye had initially used an iPhone application in which it detects the face of a person in finding a celebrity lookalike as she had decided to use it for herself for fun. In result, Park Shin Hye resulted with 100% of herself. The text within the picture "Are you sure you’re not a celebrity?" struck those who came across the picture, creating laughter amongst them. Those who have come across the picture made comments like “Park Shin Hye’s Doppelganger is Park Shin Hye,” “This is fascinating. Even the age is similar,” “The application seems to be on-point,” and other comments.